CHOBHAM have not been without their problems of late, but last Saturday’s performance against Camberley was one of the worst in recent times. During his post-match reflection, Chob player coach Ryan Gregory had no defense of his team’s showing against Camberley, conservatively describing it as a “terrible day at the office”. The villagers travelled to Watchetts Recreation Ground for what was their fourth game against a top 5 London 1 South side in as many weeks. Despite coming into the game off the back of five straight defeats, Chob were still confident of causing an upset. Although, it was evident from the first whistle that Camberley were not going to be a pushover, far from it. 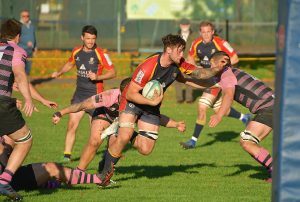 As it proved when a defensive lapse in Chobham’s back-row allowed the hosts to score their first seven-pointer under the posts, which was quickly followed by a penalty from the tee of the Camberley fly half. The visitors then received a caution, which only seemed to knock their confidence and enabled the hosts to take full advantage by scoring quick-fire tries, Camberley very much in the ascendancy. A try through Josh Devitt saw Chobham go in at half-time with the scoreline at 48-7. But Camberley remained just as clinical in the second half, scoring tries at regular intervals to run out easy winners 84-17 at the end.